Saturday night, at the Reebok Stadium, Bolton, England, Hatton Promotions hosted a thrilling night of boxing which headlined three Title fights. Steve Foster Jnr forced a surprisingly quick defeat over Armenian-born Kirakosyan. Both men tumble over in the final minute of the third round, fighting resumes but Foster reacts immediately – landing a left to the chin followed by another left as Kirakosyan begins to fall. He drops to the canvas and although he makes the count, he is visibly dazed and Referee Adrio Zannoni stops the contest. 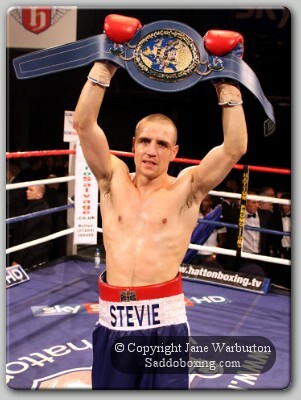 Foster wins the European Super-Featherweight Title (much to the delight of father – Steve Foster Senior!). Foster junior improves to 28 wins (18 by KO) 2 losses and 1 draw. Kirakosyan drops to 33 wins (23 by KO) 6 losses (3 by KO). Morris gets busy straight away with the left jab while Crolla is happy to let his opponent work, coaxing Morris to use the whole canvas. A confident start from Morris and a more ‘calculating’ opener for Crolla. Morris continues with the busy work-rate in the second frame and Crolla – with a high guard – starts to pick his shots but is still content to let Morris cover the ring while he keeps central. Round three and Crolla picks up the pace, and Morris’ face starts to look a little swollen from the success of Crolla’s punches in the fourth. Rounds five to seven were thrilling - from my ringside position - I can almost feel each sickening blow. Round six and Morris’s right eye is badly swollen and his face is red from Crolla’s heavy punches. Mid-way through the seventh, Crolla offloads a number of heavy punches which rock back the head of Morris – his face now bloody and swollen. Both men are toe-to-toe, but Crolla’s punches hit hard into the face of Morris in the last forty seconds. Crolla digs in a left to the body and Morris clearly ‘felt’ it. Crolla keeps up the head-shots and Morris tries to hold on to his opponent. Referee Dave Parris parts the two men and Morris leans back on the ropes for support. But Morris takes more shots to the head – unable to keep his guard up and Referee Parris jumps in to stop the contest. Anthony Crolla wins the English Super-Featherweight Title and improves to 19 wins (7 by KO) 2 losses. Morris drops to 19 wins (7 by KO) 4 losses (3 by KO). 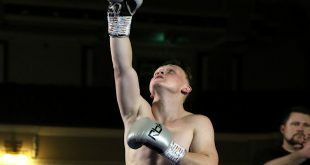 St.Helens Boxer – Craig Lyon, forced a fifth round retirement of Ross ‘The Boss’ Burkinshaw to take the English Bantamweight Title. Lyon dominated from the off with solid, confident punching and Burkinshaw was on the canvas inside the first 30 seconds of the opening round. Although giving a brave and gutsy effort – Burkinshaw’s nose was damaged and his face swollen by the end of the fifth so Trainer Glyn Rhodes pulled him out. 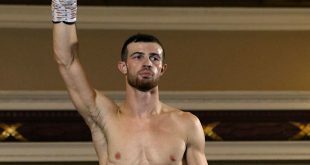 Colin Lyon wins the English Bantamweight Title and improves to 12 wins (4 by KO) no losses, while Burkinshaw drops to 9 wins (5 by KO) 3 losses (3 by KO) and 2 draws. 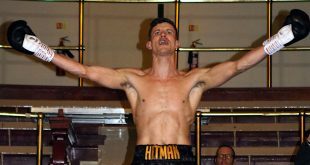 Rhys Roberts had a quick nights work when he faced Venezuelan - Manuel Sequera. Sequera was down inside the first minute of the second frame after a barrage of shots which began with a couple of decent body-shots. Roberts keeps up the pressure and – while backed up in his own corner – Sequera is stopped by Referee Howard Foster. Roberts wins by TKO round two and improves to 11 wins (2 by KO) no losses while Sequera drops to 10 wins (7 by KO) 18 losses (11 by KO) and 1 draw. 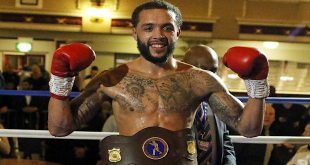 Askin secured a points win over experienced Anthony (60-54) and improves to 8 wins (4 by KO) while Anthony drops to 7 wins (5 by KO) 16 losses (2 by KO). Debutant Etches got off to a confident start against Walsh who he had backed up on the ropes. Walsh was on the canvas at the start of the second frame then was under pressure from Etches in the neutral corner for the rest of the round until Steve Gray stepped in to stop the contest. A good first win for ‘The Bomber’ Etches. Walsh drops to 2 wins 11 losses (2 by KO) 1 draw. A good points win (40-36) for Perry, who improves to 13 wins (2 by KO) and 1 draw. Lawler drops to 6 wins (1 by KO) 7 losses (3 by KO).